Paul: Quinns, are you ready to do this? Quinns: You ask that question and, immediately, I’m concerned. Paul: It’s fine. It’s great. I have a great idea. 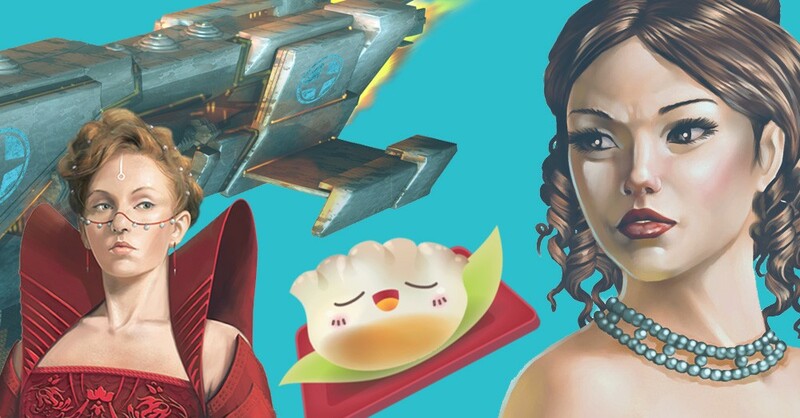 This fortnight’s news has some big announcements but also games about POISON and STRING and CASTLES, which are three of my favourite things! I’ve decided the best thing would be if I beatboxed the news and you… sort of sang a song? Quinns: No. No, that’s a dreadful idea. And I’m very particular about fluids right now after spotting Toast on Kickstarter, a game about decieving and poisoning up to eleven other people. Eleven! 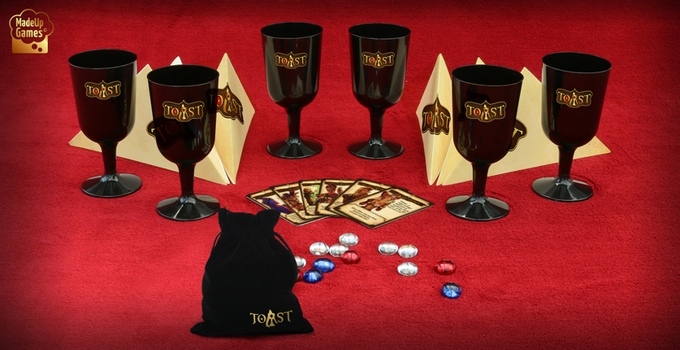 It looks a lot like Mascarade but instead of passing character cards around, you’re passing real-life goblets filled with real-life poison (tokens). With luck, it might capture a bit of the magic of that one scene in Princess Bride? Paul: That’s not really a song. I was expecting something rhythmic. 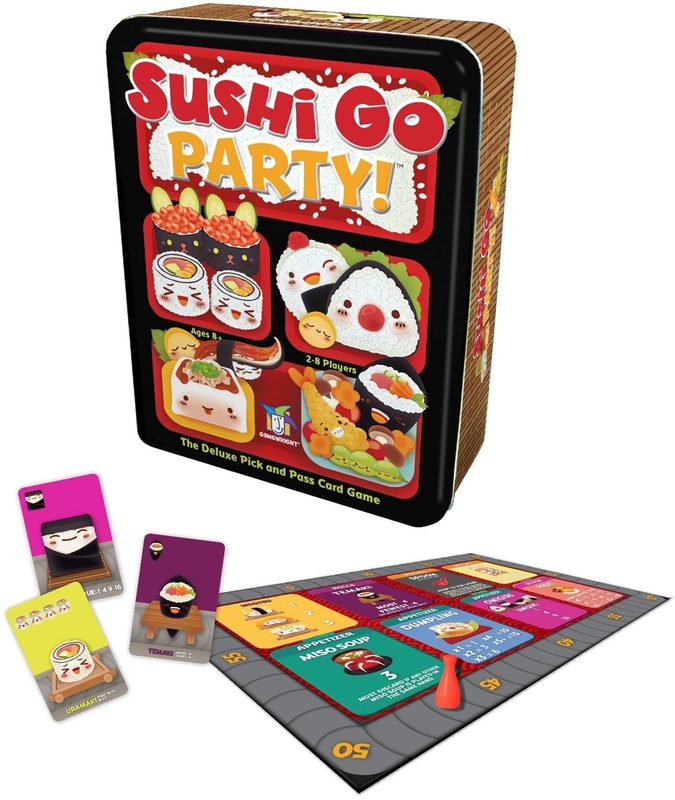 Btpbtpbtpbtpbtpvwazzup we got btpbtpbtp excellent card drafting game Sushi Go! comin’ back at us once again in an expanded new form. Sushi Go Party! 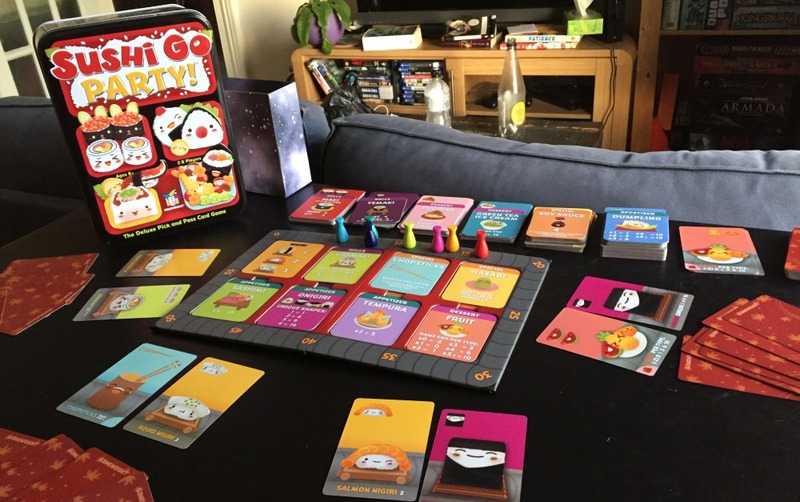 is a seriously expanded form of the game, which allows you to play with new, custom “menus” of food and ups the player count from five to eight. Ahh-b-diddy-diddy-woo tkca-tcka-tcka-WURRRRM. Quinns: Paul don’t. People are watching and anyway you’re just sort of… forgetting to make the noises most of the time. Just hold up some pretty pictures, okay? Like this one! 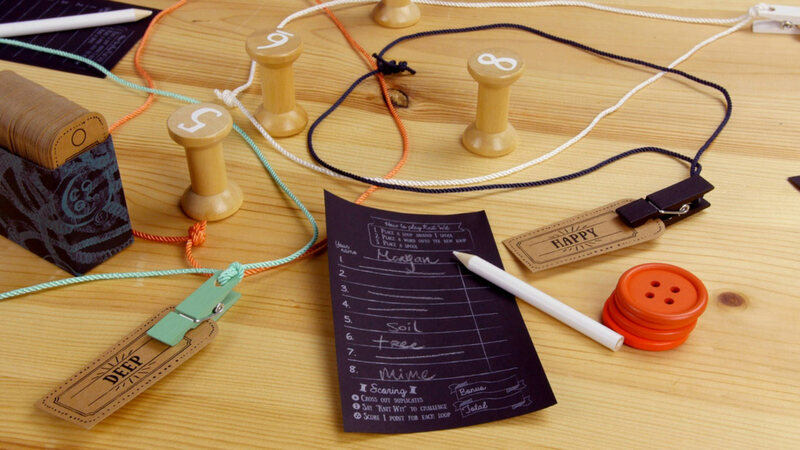 This wonderfully attractive picture is of the forthcoming Sol, from the cutely-named Catch Up Games. Sol is a team game set on a forgotten treasure island, with one side playing conquistadors and the other adventurers, both racing to find the treasure of the God of the Sun. And we all like our team games here at SU&SD, so I’m excited to see another on the horizon. The God of the Sun, too! What do you think their treasure might be? Plus, if my eyes don’t deceive me, one of the playable characters is a parrot. Caw! Paul: We got the big news the king news the Matt Leacock string news! 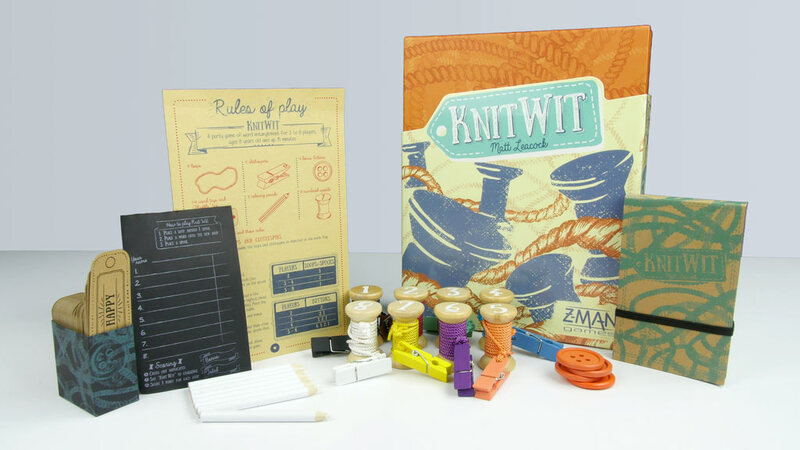 The acclaimed designer of Pandemic and Forbidden Island has been busy working on Knit Wit, a word game played by spooling string around tags and then trying to come up with phrases or words associated with the tags that have inevitably been caught in some combination of overlapping circles. It looks both nuts and wonderful, one of those things I can see a lot of players immediately catching on to. B-dup. 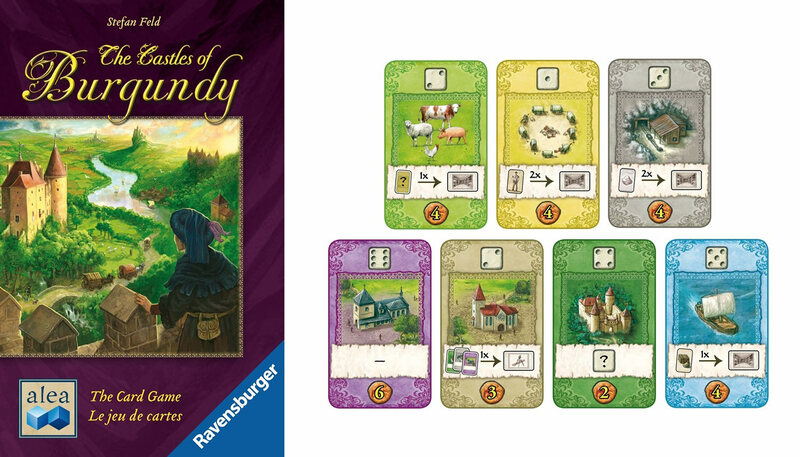 Paul: Fthafthaftha-grnnn I got excited by the announcement of The Castles of Burgundy: The Card Game! Quinns: Oh, I’ve got some mixed feelings about this. If I want to play Castles of Burgundy, I’ll play Castles of Burgundy, you know? I’m not sure which niche this is filling. Plus, it’s not like Stefan Feld is particularly well known for his card game designs. From my foggy, jaded eyes I just see this as a card game from a designer who’s a lot more comfortable working within heavy, complex systems, that re-uses a lot of art assets from a game I already have… ! That said, your Roll for the Galaxy review last year showed there’s some value in taking established games and coming at them from an entirely different perspective. Paul: Days of Wonder make some of the best, most beautiful boxes in the business, but they make just one new title every year. 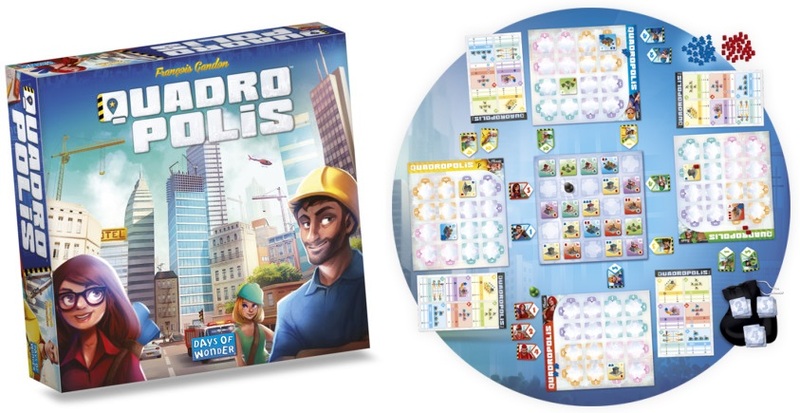 This week they announced Quadropolis, their 2016 entry into the market and a game of building cities! Quinns: Yes. Basically you claim tiles for your personal city from a central board, but when you take a tile the next player can’t take a tile from the same row OR column. And then you’re playing a similar grid-based game when it comes to placing these buildings in your town. Quinns: And in the years before that we got Relic Runners and Cargo Noir, which were straight-up mediocre. Quinns: But then if you go far enough back into the company’s history you get Small World, Memoir ‘44 and Shadows Over Camelot, which are some of the best games in the business! So who knows? Not me, that’s for sure. And finally! 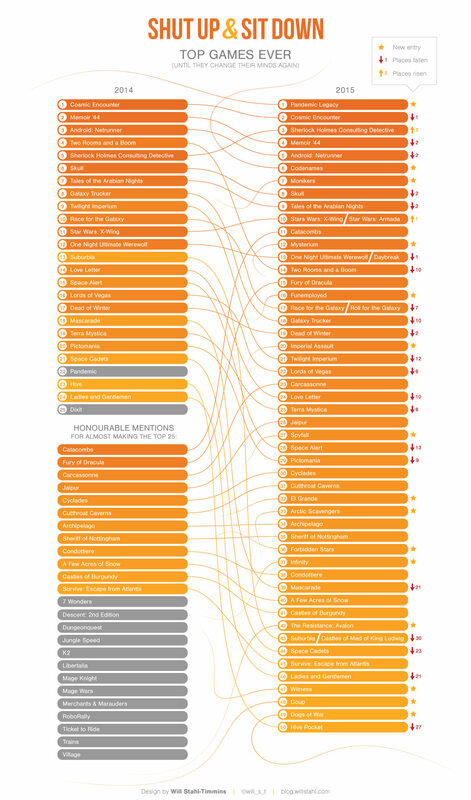 SU&SD superfan Will Stahl-Timmins shared the above infographic with us. Click it for bigger! As big as you please! 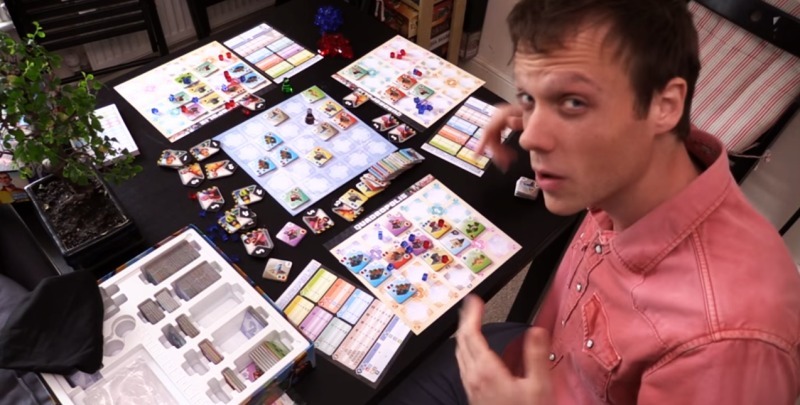 What you’re looking at is our Top 25 Board Games Ever from 2014, and how it changed to become our Top 50 in 2015. 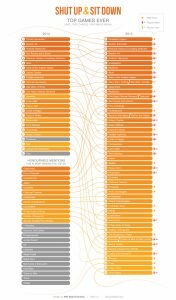 Some very interesting data there! All of our fickle feelings, laid bare. For a similarly awesome written report, you can check out this comment from Gary Denton, too. Paul, I’ve just checked the analytics for the site and, according to this, I think your beatboxing attempt has alienated everyone except for one sleeping man just outside of Aberdeen and a pair of llamas in Peru. Paul: We have llama readers? Quinns: Actually, it seems they’re just staring through a window at a laptop showing the site. One of them was just distracted by a leaf. Paul: No! We have to get him back! Quick, do a breakdance.